Leopards and I have a funny relationship. I've had to exert quite some patience to obtain photos of them - like on THIS occasion in the Kruger National Park. But this post is not about a Kruger leopard. Ever since visiting the Kalahari for the first time in 14 years back in 2009, I had a strong desire to see and photograph the elusive leopards living in this harsh environment. For some people, these leopard sightings in the Kgalagadi Transfrontier Park come like flies to dung...you see them posting trip reports on forums or sightings photos on social media and it's just leopards left, right and centre...but not for me. It took me 8 trips in 6 years to even SEE my first leopard. And that was a very fleeting sighting of a male leopard drinking from the camp waterhole at Urikaruus under the floodlight in December 2014. We narrowly missed a good sighting of a mother and cub the following day (arriving at that specific waterhole literally 5 minutes too late). So you can imagine that it became quite the photographic obsession for me. 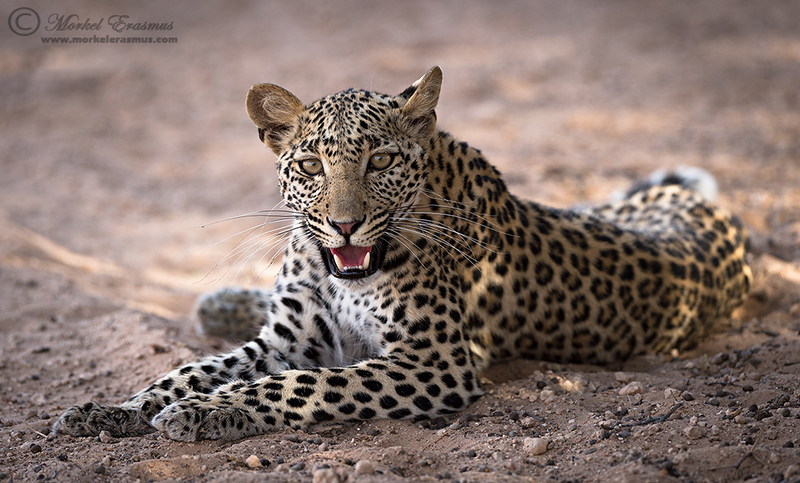 On our recent safari to the Kalahari, the "streak" was firmly broken as we had 4 good leopard sightings. The photos were not spectacular, but being able to at least spend time with the felines that had eluded me successfully over 9 separate trips to this place (in 7 years), was very satisfying and fulfilling in the end. This was the first one - the one that broke the drought for me. Don't believe me on the temperature? We drove up towards the Montrose waterhole where the leopard had been spotted in the morning. We hadn't spoken to anyone who'd physically seen it so we just looked into every nook and cranny of the calcrete ridge on the left and in the trees and riverbed on the right. Suddenly, as we drove into a small loop road there she was! She scuttled out of a small shrub (where I would have never thought to look as it was so dense and thorny) as my vehicle came around the shrub. I was able to create a few frames as she lay down in the shade of the tree, before crossing the road and climbing up to the calcrete ridges. Once she lay down among the calcrete, the camouflage was amazing. If you are ambling along on a game drive, even at a low speed of say 20km/h, would you spot her here?? 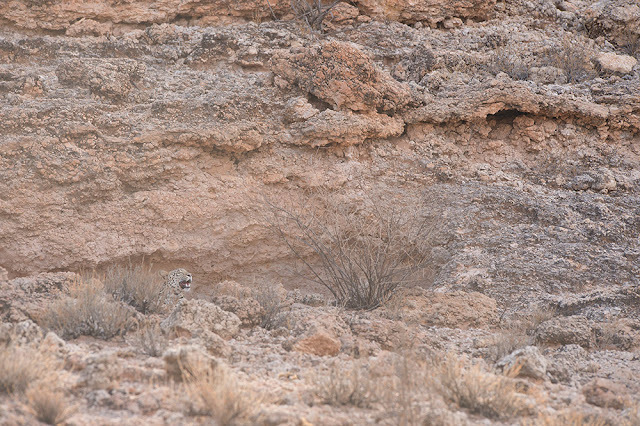 Even when she started walking along against the backdrop of this rocky ridge - she was pretty well camouflaged! How many people have driven right past leopards on these ridges so distinct to the Kalahari? Many, and I'm sure I have on my past trips as well. Even while we were sitting watching the leopard (with only her head visible), another vehicle came past us, gave a quick look, and drove off before we could tell them that there was a leopard! What's the take-home message for all you avid nature photographers? Everyone's got that one elusive shot or species that haunts you - your Achilles' heel. The only way to get the monkey off your back - is to go back time and time again to the place where you have the highest probability of getting the sighting and/or the shot, and have patience to sit it out when you're there, and the fortitude of mind to resolve yourself to the next time if it doesn't work out at that particular time. Don't give up!! This leopard photo was 7 years in the making! Was nice reading this article Morkel.Good leopard and Cheetah sightings also aloots me.I always just miss them.From 2hrs to days. Thanks Neil - best of luck for you in the Kalahari! Glad you broke the leopard streak and what a great image too! I've crawled those ridges at 10kmh til my eyes hurt - so hard to see anything!! 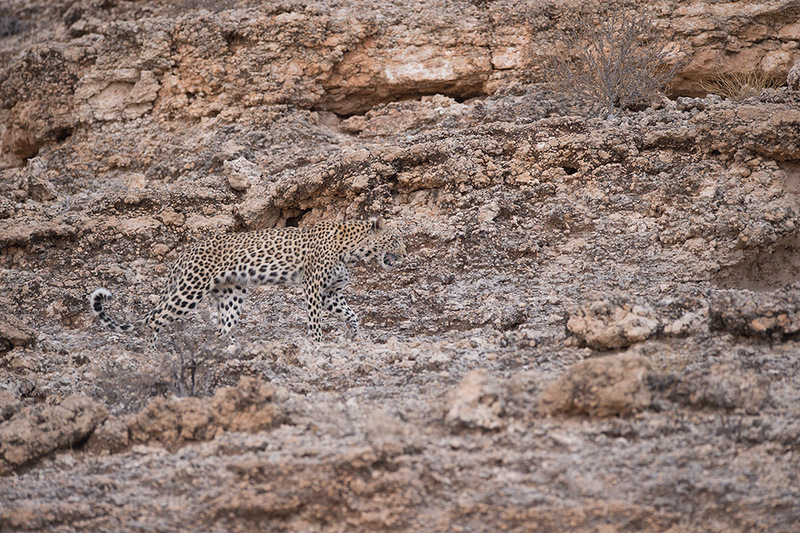 Always take leopard sightings as luck rather than any skill at finding them on my part.